“What I’m reading now” is, today, more of a “what I just finished reading”, because I couldn’t quit until I knew the ending. Mead takes months to make, people. You can’t just guzzle it all in an afternoon. A family reunion of sorts occurs on a semi-isolated farm when the sons of a local chieftain bring their wives and children to visit their parents–and maybe get a hint of where their father has hidden the treasure he is rumored to have brought home from his days raiding. Tempers run high, and, inevitably, blood spills. (Quite a lot of it.) Rough justice requires that someone pay for the death. The question is, who? Helga, an adopted daughter, is determined that nobody innocent will be scapegoated, but innocence turns out to be complicated. Helga has to pit her wits against that of the murderer, and in the process has to discover exactly how different she may be from her foster-family. 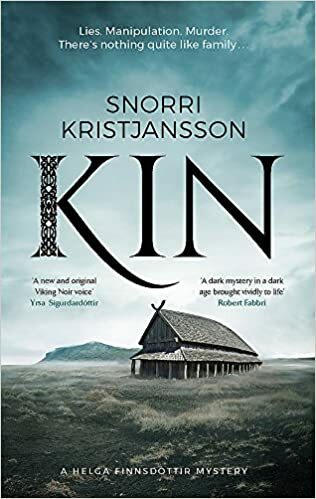 Without spoiling the plot, I’d summarize Kin as a cozy murder mystery plus Vikings. While cozy might seem like a strange descriptor for something involving so many axes, I think it fits a little better than noir, which is the other way I’m seeing the book talked about. To me, the difference between the two is primarily one of intimacy–and the murders in this book are nothing if not intimate. While the detecting/puzzle solving in the book was entertaining, I really enjoyed the characters’ depth, and the ways that Helga has to grow up and question her assumptions about the world in the course of the story. I think it’s easy to forget exactly how isolated people’s lives could be in an era when travel was more dangerous, and the “locked room” aspect of the puzzle served not only to limit the number of suspects, but to make Helga’s psychological distress more intense and believable. Plus, it’s always fun to have a lot of female characters in a book who aren’t afraid to throw punches or swing knives. All in all, I recommend getting yourself a cup of mead (it tastes like whatever flowers the bees were eating when they made the honey, you know) and settling down with Vikings and death this weekend. But not my mead, though. Get your own.